The Yellow and Blue Poison Dart Frog has a slim body with a rounded snout. Yellow and Blue Poison Dart Frogs have slender legs with toes and fingers having small adhesive discs for climbing. It is the largest of the family and is over two inches long. It has no teeth. Its color, black with brilliant yellow stripes and a blue belly and legs with black spots, alerts potential predators that its skin holds a poisonous liquid which is unpleasant to the taste. They may also be colored brown-black with venally yellow and white stripes depending on the area where they are found. 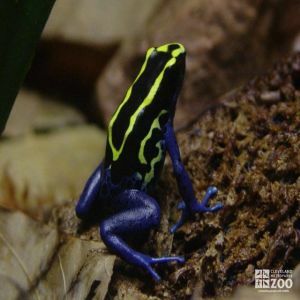 The range of the Yellow and Blue Poison Dart Frog is South America: French Guiana, Guyana, Surinam and Northeastern Brazil. Yellow and Blue Poison Dart Frogs inhabit Rain forest in cracks or clefts of tree trunks sometimes 30 feet above the ground and near a stream. Incubation: Yellow and Blue Poison Dart Frog larvae hatch in about two weeks and front legs erupt from the tadpole in three months. It becomes a frog shortly thereafter. In Yellow and Blue Poison Dart Frogs, mating is done by amplexus in which the male clasps the female while she lays her five to 20 eggs. He fertilizes these immediately after they are expelled before the jelly which surrounds them swells. All eggs are laid on the ground and are guarded by the parents until they become larvae. The male then attaches the larvae to his back by a mucous secretion and carries them to a stream. Here they develop into tadpoles and eventually into frogs by metamorphosis.